For the past four years, ASCAPAC has challenged its members to promote awareness of ASCAPAC within their states. The competition begins at the start of the calendar year and runs until ASCA’s annual meeting. The state with the highest percentage of participation and the state with the most money raised are recognized at the annual meeting. 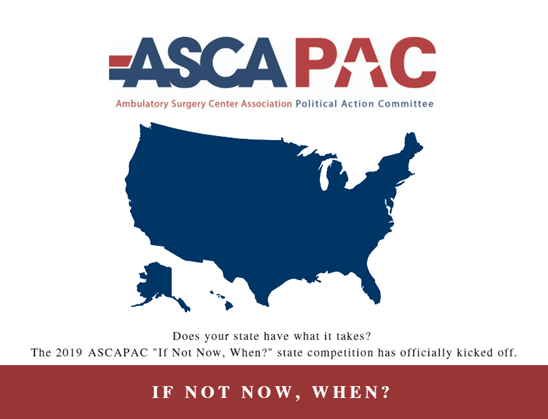 The 2019 ASCAPAC “If Not Now, When?” state competition kicks off Thursday, January 10. Leaders have volunteered to help organize efforts in their states. Please see the list of volunteer state leaders below. If your state does not have a leader and you would like to assist, please contact ASCA's advocacy team. Alaska Need volunteer state leader(s). Arizona Need volunteer state leader(s). Arkansas Need volunteer state leader(s). Delaware Need volunteer state leader(s). Georgia Need volunteer state leader(s). Hawaii Need volunteer state leader(s). Idaho Need volunteer state leader(s). Illinois Need volunteer state leader(s). Indiana Need volunteer state leader(s). Iowa Need volunteer state leader(s). Kansas Need volunteer state leader(s). Kentucky Need volunteer state leader(s). Louisiana Need volunteer state leader(s). Maine Need volunteer state leader(s). Maryland Need volunteer state leader(s). Massachusetts Need volunteer state leader(s). Missouri Need volunteer state leader(s). Montana Need volunteer state leader(s). Nebraska Need volunteer state leader(s). Nevada Need volunteer state leader(s). New Hampshire Need volunteer state leader(s). New Mexico Need volunteer state leader(s). New York Need volunteer state leader(s). North Carolina Need volunteer state leader(s). North Dakota Need volunteer state leader(s). Ohio Need volunteer state leader(s). Oklahoma Need volunteer state leader(s). Pennsylvania Need volunteer state leader(s). Rhode Island Need volunteer state leader(s). South Carolina Need volunteer state leader(s). South Dakota Need volunteer state leader(s). Tennessee Need volunteer state leader(s). Utah Need volunteer state leader(s). Vermont Need volunteer state leader(s). Virginia Need volunteer state leader(s). West Virginia Need volunteer state leader(s). Wisconsin Need volunteer state leader(s).